These cookies are gluten-free, dairy-free…and egg-free! And they are chewy and delicious! 1. Preheat oven to 350F, and line 2 large cookie sheets with parchment paper. 2.Melt oil and honey together in a small sauce pan. 3. Meanwhile, combine all dry ingredients in a medium bowl. 4. Remove oil and honey from the heat and stir in vanilla extract. 6. Drop dough by rounded tablespoon onto parchment paper. I literally use a TBSP measuring spoon for this step. Especially if making the thin variety, don’t place more than 6 cookies per sheet because they spread out a LOT! 7. Bake one sheet at a time on middle rack for about 8 minutes, until edges just begin to brown. Watch carefully in the final couple minutes, as ovens vary and these turn quickly from “done” to “burnt”! 8. Slide cookies (w/ parchment) onto a cooling rack. Enjoy warm or allow to cool completely for about 20 minutes, and enjoy! For thicker cookies (shown in the photo above on the left), use 1 1/4 cups. 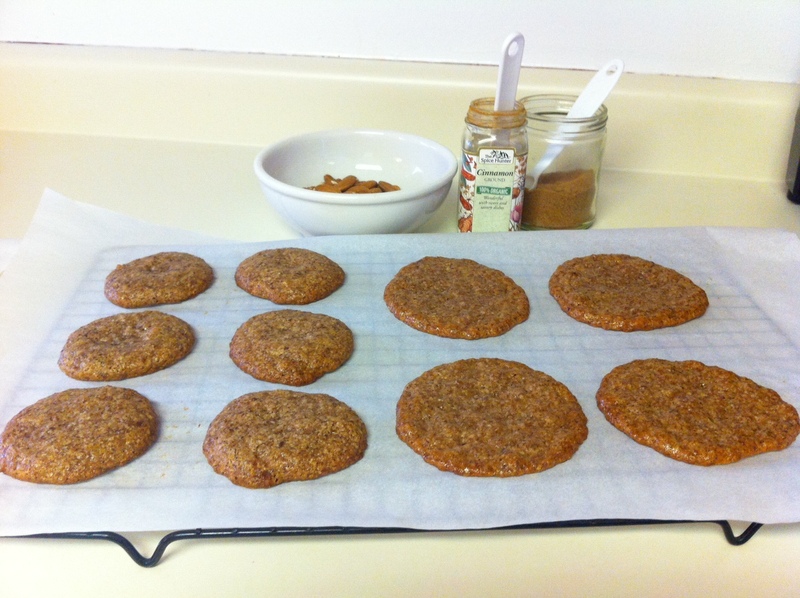 For thinner cookies (shown in the photo above on the right), use just 1 cup almond meal. Both varieties are equally chewy and delicious, but Chad and I prefer the thinner ones!! Also, I’ve only tried these with Trader Joe’s brand almond meal, not almond flour, so I’m not sure how these would work otherwise. I did also try with my own homemade almond meal, but I needed to use 1 1/4 cup of that to get the thinner version (instead of the just 1 cup needed with the store-bought variety), and I didn’t try to make the thicker variety with my own almond meal. I assume the difference is that the store-bought variety is drier?? This entry was posted in Money Savers, REAL FOODS Lifestyle, Recipes and tagged bargain, community, deal, food, online, real, recipes, sale, savings. Bookmark the permalink.